The 6th annual Taste of the City was held on the grounds of the Pacific National Exhibition (PNE) on July 19th, 2008. Top restaurants and caterers from around the Lower Mainland were selling bite sized portions of food so that the general populace could sample them. There was a great diversity among the cuisines, matching the multicultural makeup of the city. Unlike EAT! Vancouver, where there was an entrance fee and plenty of other forms of culinary entertainment available to sooth the palate, this event was free and focused on filling the belly, one morsel at a time. Held at the historic Westminster Quay by the mighty Fraser River, Fraserfest is a celebration of the riverfront lifestyle. Harbour tours were being offered but I opted for a relaxing stroll from one end of the boardwalk to the other. The Burnaby Association of Marine Modelers (BAMM) had painstakingly created miniature models of boats and ships, including one of a SeaBus. The highly entertaining live theatrical presentation of the lives of salmon - "Voices of the Fraser" - featured a stirring rendition of the song "It's Not Easy To Be A Salmon These Days". Taking place in New Westminster, Fraserfest attendees were primarily pensioners, young families, or international heartthrobs. 2 hours drive to the base camp. One hour bus ride to the starting point. 5 minutes in the river until flipping the boat, being submerged underneath it, battered by rocks, and eventually pulled to safety by the guide. Part 3 of a 3 part mini series. Part 1 is here and Part 2 is here. The guides took me on to the shore and checked my mental state. My complexion was pale, my hands were quivering, and my body was bruised, but my spirit was unbroken. I was offered the option to return to the bus and end my adventure, but my uncommon valor prevented me from accepting the offer and I chose to continue. This decision was met with a chorus of cheers from my male admirers. Tears of joy were flowing from the eyes of my female followers, and once they had been assured that I was alright, they too chose to continue the trip. We switched boats, with the most experienced guide taking over our old boat, and journeyed onward. The rest of the 2 hour plus voyage was uneventful compared to the first five minutes, with a few more close calls but no serious incidents. During a calm stretch, members of other boats took a swim in the chilly waters, but there were no volunteers from our boat. The backdrop was amazing, with glaciers and extinct volcanoes on each side of the river and tropical forests readily noticeable. I did not encounter any wildlife during the journey, apart from a mouse that crossed the street on the Sea to Sky Highway during the drive to Squamish. After changing back into dry clothes, a hearty barbecue awaited us. The hot showers were not operational, but I had already had a cold shower. I signed an incident report that had to be filled out by our guide due to our accident. I mentioned that apart from general soreness and slight damage to my spectacles, I had a rash around my wrist. He said it was probably from friction with the wet suit. A passerby remarked that I should show him my other rash. The experience was one I would not want to repeat, but one that was worth trying once. As the tagline of the adventure company stated - "Live Stories Worth Telling". 2 hours drive to the base camp. One hour bus ride to the starting point. 5 minutes in the river until flipping the boat, being submerged underneath it, battered by rocks, and eventually pulled to safety by the guide. Part 2 of a 3 part mini series. Part 1 is here. Since there were more of us than could fit on one boat, a spirited game of black/white was played to determine which three would join another boat. Me and two others lost. Our guide had two years experience and our boat had a leak. He was using a water pump to remove water when we got on. He taught us basic paddling maneuvers and we were off. 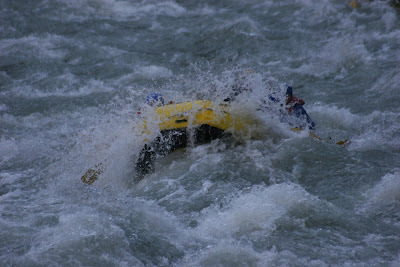 The first serious segment of white water rapids in the river was fast approaching - the Devil's Elbow. We would later learn that many souls had begun their journey to the afterlife here. A half uttered warning left our guide's mouth before he left the boat. The left side of our dinghy went up in the air and folded over the rest of the boat, flipping it over completely. My worst fears had become a reality. I was underwater in complete darkness. The overturned boat was on top of me, and I was in a dark air bubble. I somehow got myself from underneath the boat and found myself slipping away from it. After swallowing several litres of glacier fresh water I was able to grab hold of the perimeter rope and get on my back. The bottom half of my body bounced against rocks and I felt all that would remain of my barely recognizable carcass was the upper half. Suddenly, I saw my coworker Jose struggling for survival behind me in the rapids. Without a second thought about self preservation, my heroic instincts kicked in. I offered him my paddle but as soon as he caught hold of it, I hit a rock and let it go. He disappeared into a swirling vortex of water and I thought I had lost him forever. Before I could begin grieving, I was hauled into my boat by my guide. Inexplicably, half the occupants had changed. Apparently they had jumped onto our boat from other ones to help the guide retrieve us. I had lost my paddle while Vince, the other coworker on my boat, had permanently disfigured his after getting it wedged between some rocks. Jose had been rescued also in the meantime. 2 hours drive to the base camp. One hour bus ride to the starting point. 5 minutes in the river until flipping the boat, being submerged underneath it, battered by rocks, and eventually pulled to safety by the guide. Part 1 of a 3 part mini series. My first weekend outing with ResponseTek was an unforgettable experience. 11 colleagues, 10 of whom were eagerly awaiting the excursion, made their way to the base camp on the outskirts of Squamish, British Columbia. After signing waivers absolving the adventure company which was organizing the river rafting of any responsibilities, everyone pulled themselves into form fitting wetsuits and booties after considerable groaning and grunting. My coworkers told me that I had worn my wetsuit inside out so I took it off and reversed it, only to be told I had been misinformed. We collected our helmets and life jackets, before boarding the yellow school bus that would take us to the starting point where we would be "put in" to the mighty Elaho River. Before our aquatic voyage began, participants were given an opportunity to relieve themselves against the bushes. I enjoyed this part thoroughly. The lead guide explained all the principles of safety and what to do in an emergency. The boats had a safety rope encircling the perimeter, and any man overboard was to try and grasp this, while someone on board would pull them up by their life jackets after they had stopped laughing. If he could not reach it immediately, then someone on the boat could offer a paddle to him and pull him in. If the victim was still to far away, a rope would be thrown, and if he was out of reach of the rope he would be best served putting himself in the safety position on his back. Two kayakers would follow and provide any assistance if needed. The worst scenario would be if the boat flipped and everyone went overboard including the guide. 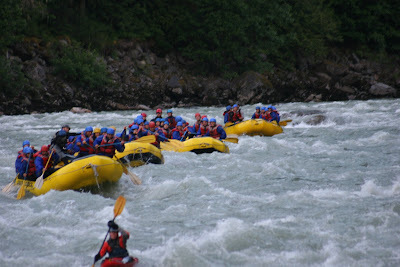 Everyone was to try to hold on to the perimeter line, until the guide could flip the boat and haul everyone back in. Statistically speaking, a boat flip happened once every 3 weeks, with around 2 people falling overboard accidentally per trip. An index is a useful tool for tracking trends in a quantifiable manner using observable facts. Indices can be used to measure almost anything from the stock market to body mass to satisfaction over a period of time using some kind of standard measure or reference. The SENSEX had some of its best years in 2006 and 2007, as the Indian economy surged. The SENSitive indEX measures the performance of the Bombay Stock Exchange (BSE), the oldest one in Asia and the largest in the world in terms of number of companies listed. The SENSEX uses a free-float market capitalization methodology to calculate the index. This takes into account the number of shares that are readily available in the market of the underlying companies that the index is composed and then multiplying them by their price. Satyam had the Associate Delight Index (ADI) to measure the job satisfaction of its employees. I introduced the concept of the Female ADI (FADI) after careful study. I noted that FADI increased at whichever office location I worked in and dropped whenever I left. When explaining this phenomenon to some of my colleagues, they said that although the dramatic rise of the FADI was interesting, what they really wanted to know was whether I could help with the MAID (Male Associated Index of Delight). The Body Mass Index (BMI) is another useful tool in measuring the status of the ARNABody's seasonal fluctuations. The BMI takes a ratio of a person's weight (in kilograms) to the square of their height (in meters) to estimate their level of body fat. The result will go into one of the following four buckets - underweight, normal weight, overweight, and obese. My mother and other females with whom I have shared a residence with have long tormented me in the morning by using harsh and unpleasant words directing me to make my bed. After I awake from my state of slumber, I see little value in participating in this daily ritual right away. I tolerate their wrath, only occasionally complying with the unreasonable demands. Fortunately, scientists have validated that it is time to give up the tedious and unnecessary task of bedmaking once and for all. Dust mites that make their home in the ARNABed can trigger respiratory illnesses and allergies. They thrive on absorbing the moisture from bed sheets and mattresses. Research indicates that if a bed is left unmade the moisture is removed, leaving the dust mites to suffer from dehydration. The humid conditions that the dust mite needs to survive are not as readily available if the bed is not covered up. By not partaking in the practice of bedmaking, humidity levels in the atmosphere and stress levels in males decrease. The mortality rate of mites and hostility levels of females increase, leaving nature's delicate balance intact. Once upon a time in the kingdom of Arnabia lived a prince in his castle. He went about his duties with honour and determination. Known for his caring heart and sharp mind, he was loved by his subjects and respected by his fellow noblemen. One day as he entered his courtyard a beautiful and mysterious maiden stood in front of him. She did not say a word, nor did he. The maiden had come from a land far away in search of a better life, but she did not think it wise to share the company of the prince. She shared a few tender moments with the prince but never let him get too close. She spent her days doing simple tasks for whomever asked her to, save for the prince. As the days passed she seemed to become sadder and more detached, even withdrawing from the company of other peasants. Detecting her loneliness, the prince arranged for a lavish banquet in the royal hall for the maiden. She was reluctant to attend but was required to do so by order of the court. The maiden, a fiercely independent creature, was upset greatly, and from that day onwards her defiance towards the prince grew. As a gesture of goodwill, the prince had on several occasions sent a messenger to her to request items for the royal pantry, but the emissary was always sent back empty handed. Unbeknownst to her, he had even arranged for her stipend to be increased. Each act of kindness by the prince was ignored or rebuffed by the fair maiden. When famine struck the nation, the prince spurred his people to band together and help those in need. The maiden assisted with great enthusiasm in this endeavour, but before the prince could demonstrate his gratitude she revealed she was going away, but where she would not say. The next day she left without saying farewell, and that was all there was of the story to tell. While at a Bengali cultural event, I mentioned to other attendees that the birthplace of the rosogolla (or rasagolla or rasgulla) was Orissa and not West Bengal, but nobody was impressed with my sweet talk. Rosogollas are sweet, plump, and juicy delights of non-female form. It is the favourite sweet or "mishti" of Bengalis and many other Indians. It is the state of West Bengal that is generally associated with this treat. During my days with Satyam, a coworker from Orissa informed me that in reality the rosogolla was created in his home state. I was shocked by his statement and proceeded to verify this information from secondary sources. I checked the usually reliable centralized collection of mass knowledge known as Wikipedia. Sure enough, what was written there was in line with my colleague's comments: "The rasagolla was invented in the state of Orissa, where it has been a traditional sweet dish for centuries. 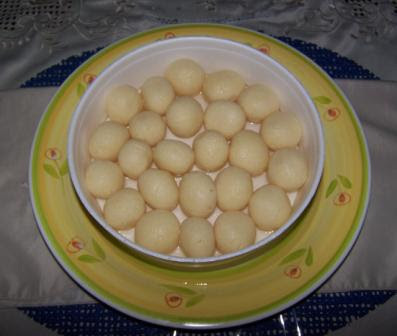 The recipe for making rasagollas eventually spread from Orissa to neighbouring West Bengal. This was during the Bengal renaissance when Brahmin cooks from Orissa, especially from Puri, were routinely employed in richer Bengali households. They were famed for their culinary skills and commonly referred to as Ude Thakurs (Oriya brahmin-cooks). As a result, many Oriya delicacies got incorporated into the Bengali kitchen". "By the time the recipe reached Nobin Das (which was either in 1868 or a few years earlier through another confectioner, Haradhan Moira), it was already a traditional item in Orissa - standard fare in the cities of Bhubaneswar and Cuttack, and of course in Puri." Jayanta Mishra mentioned that "One can easily see how the popular misconception that Rasagulla originated in Bengal arose. It gained nationwide popularity only via Kolkata, with its better marketing infrastructure. Besides, one must not forget that when Rasagulla became popular, the state of Orissa was itself a part of the province of Bengal under the British". The only related article of interest yielded by Google Scholar was on the prevalence of coronary heart disease in Kolkata due to the eating habits and sedentary lifestyle of its inhabitants. For true lovers of the sweet delight, it does not matter who invented the rosogolla but that someone did. My artistic talents came to the forefront when I was invited to participate in the carving of the Spirit Pole for the Cowichan 2008 North American Indigenous Games. Touring the whole province, the 20 foot long red cedar log will be transformed into a totem pole by master carver Carey Newman and hundreds of others who will also carve a portion in various communities throughout British Columbia. Once finished, the Spirit Pole will be unveiled at the opening ceremony of the Games and then remain in Cowichan Valley after the Games end. Taken from a sacred village within Stanley Park, the cedar tree was donated by the Squamish Nation. I was instructed on the proper technique which which to use the carving tool. With the desired design pattern already marked on the wood sculpture, I skillfully scraped away a few layers of the wood and carved a moment in history.